The current blog banter is on terrain. That's a pretty big topic and I'm going to focus on one small part of it for one small part of the community. A fleet commander has a big learning curve. One in fact that never truly stops because fights are so different and the complexities such that permutations are endless. I wouldn't want to put anyone off starting just by grabbing a few of your friends and roaming about until you find someone to shoot. I do think though that after you've run a few fleets it's natural to want to take it to the next level. Once you've decided you want to improve and develop an edge over other FCs then one of the ways you can do it is by collecting bookmarks. Tactical bookmarks are one of the most important tools in a good FCs box and great FCs will usually have extensive collections of bookmarks in the systems they usually fight. 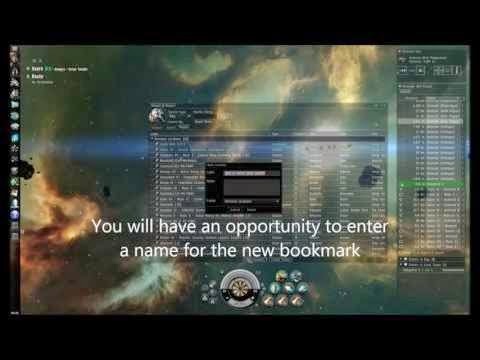 The simplest use of bookmarks in nullsec is for travelling without getting bombed or bubbled. Make a bookmark 200 km to 250km off a stargate and you can warp a fleet of ships to that gate without worrying about a dictor jumping in and bubbling the gate, or decloaking and bubbling which can be a set up for a pipe bombing attempt. (This is where a bubble traps your fleet all on the same spot and bombers decloak and launch bombs about 9 seconds before you land. You land, you're trapped, 1 second later the fuse burns out on the bombs and they blow you up). In Eve a tactical grid is by default around 250km - 300km in radius. For this reason it's best not to make your grid bookmarks over 250km from the stargate as you may be unable to see hostiles at the gate from your perch. (Perch is another name for tactical bookmark). You also don't want to make your bookmark so close that you can't jump in then warp up to your tactical. As ships appear 15km around a gate this means the minimum safe distance is 150km (minimum warp) +15 km or 165km off the gate. Any closer and you risk leaving some ships behind when you fleet warp up to your tactical. Tactical bookmarks may be made further out if you're anticipating a big fleet fight. All those objects on the tactical grid extend the grid and may make it possible to be on grid while a lot further out - 500km - 700km and still on grid is not rare. So if you're setting up to attack or defend a structure you want to make several bookmarks around the structure at warpable range as well as a couple relatively deep if expecting a big fight. (all relative to the sun. In other words if you're at the 200km behind bm and you look at the sun you'll see your starting point 200km away right in front of the sun). With the starting point (stargate or whatever) this gives you 7 warpable points in a diamond shape. Since you can warp to any of these at range this allows superlative mobility around the grid. Suppose you have ships with 100km range and your enemy is in ships with 50 km range. Set up 90km above. He'll jump in. Start shooting when he decloaks. If he's faster he'll probably burn right at you. When he gets to a little outside his effective range warp your guys to a new sniping spot. If you warp to the Left 200 bookmark at range 100km that should put you about 100km from him again and you can resume sniping. He may try instead to probe you and warp. Well you can anticipate him warping so have your guys align and as soon as he starts to warp his fleet warp yours. He'll land where you were, you land 100km off and start sniping again. Fights between experienced FCs are often cat and mouse games of positional tussling. My advice is never concede positional advantage when you don't have to. Keep bouncing around the grid until the fight is on your terms. If you don't have bookmarks prepared then you can use fleet members or alts to provide warp ins. A cov ops is a very good alt for this. Always have them moving so when people warp to them your cov ops won't get decloaked. Interceptors are great for providing positional warpins even against fleets with good damage projection. Against ishtars which, depending on fit, usually hit out to about 80-100km I used an interceptor to fly 120km behind them giving our FC the ability to warp to me at 100km and land 20km off the ishtars. You can even dangerzone your mobile Warp To ship into the hostile fleets range so long as you coordinate hitting the Fleet Warp with telling him to warp out well. Making bookmarks is often done solo and painstakingly. A very fast interceptor is the best ship - a Claw or some such with nanos in the lows. You may prefer using a covops, I have a overdrive fit Cheetah I sometimes use for this. The Cheetah is safer for bookmarking hostile poses. No description of terrain use would be complete without mention of one of the most important in-game aids - the system map. Looking at the geography of the system, the layout of the planets, stations and stargates helps a lot when preparing bookmarks there for fighting. In fact there's a technique that can be quite useful based on system geography. For snipers and bombers it can be nice to have a bookmark saved with where it aligns to in the name. Suppose you make a bookmark 50km behind a stargate in line with planet 5. Sit there in bombers. Enemy fleet jumps in. Align P5, decloak, launch bombs, squad warp the bombers to P5 (or to an in-line safe that you had previously bookmarked). Your bombers instawarp which not only protects them but means your bombs won't get aborted due to hostile fire so much. Have fun with terrain if you're an FC! It's one of the things that distinguishes a good FC.